The Russian ruble tumbled as much as 2%, sliding to 69.63, the lowest level against the dollar since March 2016 and its biggest drop since August 8 after Russia's prime minister Dmitry Medvedev effectively admitted that US sanctions are starting to bite, and said that he is hopeful that the Bank of Russia becomes "active" as rates are high. "It’s necessary to move from neutral to stimulating oversight of the credit sphere to create conditions for more confident economic growth," Medvedev said at conference in Moscow, adding that "Interest rates remain quite high despite the successes in holding back inflation." The prime minister also urged the central bank to take an “active position” to address the issue of elevated rates. According to Rabobank's Piotr Matys, "market participants are especially sensitive to any comments on monetary policy from prominent officials in current environment" adding that the USDRUB could approach 71.40 in coming weeks. "It seems that the market has interpreted comments from PM Medvedev as political interference in the monetary policy. Such remarks may undermine credibility of the central bank and Governor Nabiullina, who is well respected by investors for acting decisively during the ruble crisis only a few years ago." It came after Theresa May accused Russia of being being the Scripal poisoning, and presented alleged evidence that the two suspects in the case are in fact Russian secret service agents. With UK allies now seemingly on board the UK version of events, this heightens sanctions risk as tonight there is a UN session on the topic during which more sanctions could be announced. As the ruble tumbled, bond yields rose, with the benchmark 10Y Russian bond rising above 9% for the first time since 2016. Earlier, Russia's Deputy Finance Minister Vladimir Kolychev told Bloomberg TV that Russia is ready to take the emergency step of buying its own ruble debt if a new wave of U.S. sanctions threatens to upend the market. A coordinated response would be a first since the Finance Ministry and the Bank of Russia teamed up early in 2015 to support the ruble at the height of the country’s currency crisis. As turmoil spreads across emerging markets, Russian assets have been battered by harsh U.S. sanctions in April and a “nuclear” option proposed in Congress that could target sovereign debt. 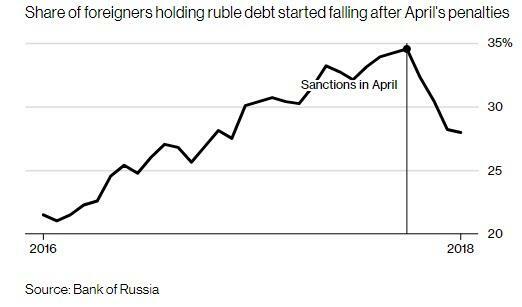 Prompted by fear about US sanctions, foreign holdings of Russian sovereign ruble debt have since declined to the lowest since 2016, and have handed investors a 12% loss since July, the fourth-worst performance among Russia’s peers tracked by Bloomberg. The share of non-residents in Russia’s ruble-denominated debt has fallen to 26-27%, according to Kolychev. That’s down from a peak of 34.5% in March and 28 percent in July, central bank data show. Still, despite the threat of the harshest U.S. measures to date, officials say Russia is prepared for the worst. At a forum sponsored by the ministry in Moscow on Thursday, Kolychev and colleagues from the central bank, Economy Ministry and a big state bank downplayed the risks from painful new measures, arguing that Russia’s in a strong position to weather any further instability, Bloomberg reported. The U.S. Senate is set to debate new sanctions to punish the Kremlin for alleged election meddling, including a raft of measures dubbed “the bill from hell” that could bar Americans from buying new issues of Russian sovereign debt and ban the largest state banks from using dollars. If U.S. actions forced foreign investors to sell Russian debt, Kolychev said in the interview that the first move would be to halt new issuance to keep pressure from building in the market. On Wednesday, the Finance Ministry canceled a bond auction - the second time in recent weeks - amid rising borrowing costs. In another sign of increasing volatility, the governor of the Bank of Russia said policy makers at next week’s meeting will consider the first increase of the key interest rate since 2014 as inflationary risks grow due to the ruble’s weakness, which however appears to be at odds with what the Russian Prime Minister wants in a situation that is starting to looks similar to what is going on in Turkey.